A high quality solvent based aerosol combining disinfecting and air freshening properties. Bactericide destroys odour producing bacteria, effectively eliminating malodours at source. Pleasant perfume freshens all footwear. Rapid evaporation for quick drying. 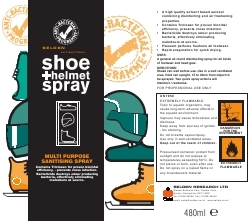 A general all round disinfecting spray for all kinds of footwear and head gear. Shake can well before use. Use in a well ventilated area. Hold can upright, 15 to 20cm from object to be sprayed. Two quick spray actions will disinfect/reodorise. Composition Perfume, aliphatic solvent and a bactericide.